The V-Lock® makes it possible to further improve the positioning of dies. A groove at the back of the tool is used to automatically align bottom tools in X and Y directions, and to firmly clamp them in place. 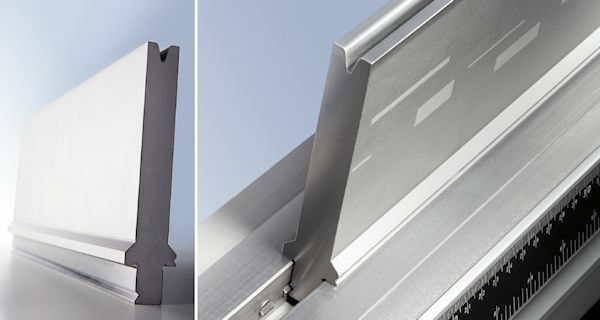 This, for instance, prevents tools from sliding or being pulled upwards during the bending process. The V-Lock® helps to significantly improve accuracy and safety in the bending process. Being able to accurately position tools is also a very important factor due to the increasing level of automation. As of mid-2015, the V-Lock® will standard on appropriate Tool Holders with Hydraulic Clamping for dies (Crowning & Bottom Tool Holders) and dies. Would you like more information about V-Lock®? We will be pleased to offer you comprehensive advice.